It takes more than good looks to win a girl’s heart. Johnny relies too heavily on his physique and shallow charms to win over his romantic interests. He doesn’t realize that a girl looks beyond outward appearance for what’s inside a boy as well. All brawn and no brains is a losing combination. If Johnny would only work out his brain the way he does his biceps, he might just figure this one out, and learn how to behave. Johnny teaches us that trying to muscle your way out of every jam just won’t work, even if he doesn’t quite get it himself. Self-esteem comes from the inside. It seems like Johnny needs to have someone around who will tell him how great he is. Maybe he doesn’t believe it enough without hearing it from someone else. We learn that we can’t derive our sense of self-worth through others. An obsession to make an impression leads to depression. Johnny goes back in time to Ancient Rome, and all he can think about is being a hit with the girls. He not only misses out on a great opportunity to explore, he doesn’t get anywhere with the ladies either. Being a Dad is hard work. Johnny learns that taking care of a baby takes commitment and work. When he pretends to be a baby’s daddy in order to score with some girls, he learns the hard way that you can’t fake being a real dad. Fast moves don’t necessarily get you where you want to go. Johnny moves fast. Like, lightning fast. Darting from place to place, seemingly at the speed of light – and getting nowhere fast. The lesson? There are no short cuts to achieving one’s goals. Commitment means loving someone else more than yourself. Poor JB just doesn’t get it. He thinks so much of himself, and thinks everyone else feels should feel the same. He never learns how to show that much love for anyone else. So he winds up with his one true love every time – himself. Respect your parents. Although he may be a bit of a mama’s boy, Johnny does get points for being respectful toward her. In fact, it’s partly due to her desire that he someday meet the right girl that Johnny tries so hard. Elvis has left the building. There can only be one King, and imposters are many. Though Elvis Presley is widely considered to be the apex of “cool” for many fans, it’s much better to be yourself than to imitate someone else. Originality is much more attractive than imitation. The benefits of physical fitness. 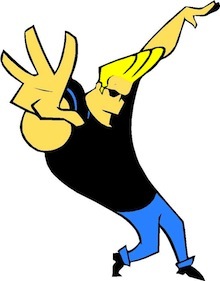 Even though Johnny Bravo is a self-centered guy, he is after all a good role model for physical fitness to a degree. Kids can learn that exercise is just one part of a healthy lifestyle, and shouldn’t let their appearance dictate their self-image.